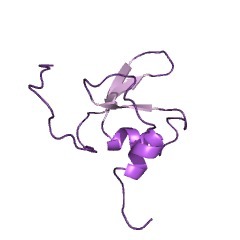 Proline-binding domain in CD2-binding protein. Contains conserved Gly-Tyr-Phe residues. The glycine-tyrosine-phenylalanine (GYF) domain is an around 60-amino acid domain which contains a conserved GP[YF]xxxx[MV]xxWxxx[GN]YF motif. 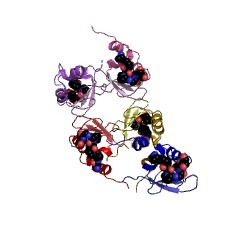 It was identified in the human intracellular protein termed CD2 binding protein 2 (CD2BP2), which binds to a site containing two tandem PPPGHR segments within the cytoplasmic region of CD2. Binding experiments and mutational analyses have demonstrated the critical importance of the GYF tripeptide in ligand binding. A GYF domain is also found in several other eukaryotic proteins of unknown function [(PUBMED:9843987)]. It has been proposed that the GYF domain found in these proteins could also be involved in proline-rich sequence recognition [(PUBMED:10404223)]. Resolution of the structure of the CD2BP2 GYF domain by NMR spectroscopy revealed a compact domain with a beta-beta-alpha-beta-beta topology, where the single alpha-helix is tilted away from the twisted, anti-parallel beta-sheet. The conserved residues of the GYF domain create a contiguous patch of predominantly hydrophobic nature which forms an integral part of the ligand-binding site [(PUBMED:10404223)]. There is limited homology within the C-terminal 20-30 amino acids of various GYF domains, supporting the idea that this part of the domain is structurally but not functionally important [(PUBMED:12426371)]. There are 1194 GYF domains in 1181 proteins in SMART's nrdb database. Taxonomic distribution of proteins containing GYF domain. This tree includes only several representative species. The complete taxonomic breakdown of all proteins with GYF domain is also avaliable. Click on the protein counts, or double click on taxonomic names to display all proteins containing GYF domain in the selected taxonomic class. 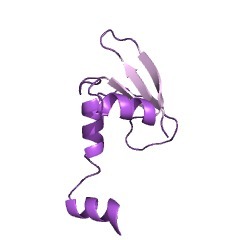 The GYF domain is a novel structural fold that is involved in lymphoid signaling through proline-rich sequences. T cell activation through the CD2 cell surface receptor is transmitted by proline-rich sequences within its cytoplasmic tail. A membrane-proximal proline-rich tandem repeat, involved in cytokine production, is recognized by the intracellular CD2 binding protein CD2BP2. We solved the solution structure of the CD2 binding domain of CD2BP2, which we name the glycine-tyrosine-phenylalanine (GYF) domain. 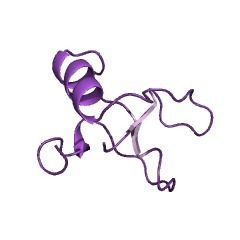 The GYF sequence is part of a structurally unique bulge-helix-bulge motif that constitutes the major binding site for the CD2 tail. A hydrophobic surface patch is created by motif residues that are highly conserved among a variety of proteins from diverse eukaryotic species. 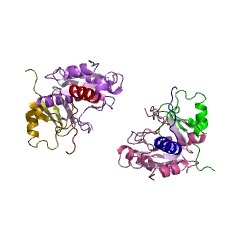 Thus, the architecture of the GYF domain may be widely used in protein-protein associations. Identification of a proline-binding motif regulating CD2-triggered T lymphocyte activation. 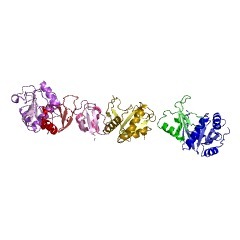 An intracellular protein termed CD2 binding protein 2 (CD2BP2), which binds to a site containing two PPPGHR segments within the cytoplasmic region of CD2, was identified. Mutagenesis and NMR analysis demonstrated that the CD2 binding region of CD2BP2 includes a 17-aa motif (GPY[orF]xxxxM[orV]xxWxxx GYF), also found in several yeast and Caenorhabditis elegans proteins of unknown function. In Jurkat T cells, over-expression of the isolated CD2BP2 domain binding to CD2 enhances the production of interleukin 2 on crosslinking of CD2 but not the T cell receptor. Hence, a proline-binding module distinct from SH3 and WW domains regulates protein-protein interactions. 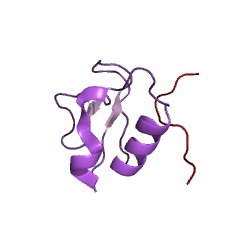 4bws Crystal structure of the heterotrimer of PQBP1, U5-15kD and U5-52kD.